■ A non greasy concentrate of aloevera juice & rose water, being a totally natural product rejuvenates dry skin and hair. I have already tried an organic shampoo and other organic beauty products. 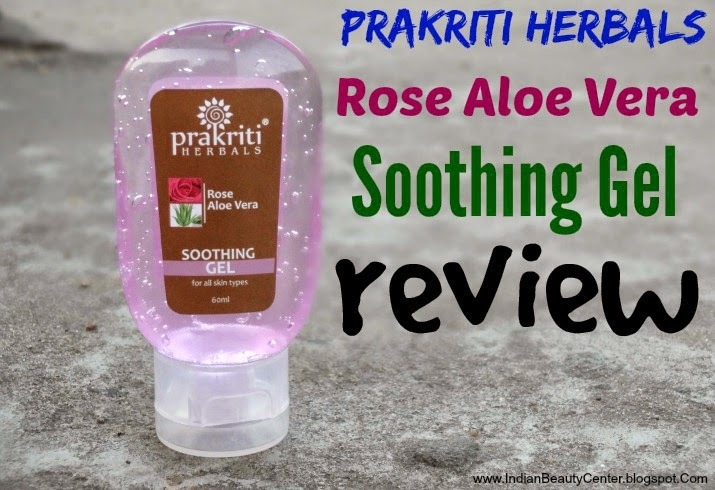 So, while looking for another natural shampoo online, I came to know about Prakriti herbals. Their packaging instantly attracted me and I decided to try this Aloe Vera Rose Gel from their skin care range of herbal beauty products. This comes in a plastic tube in a very cute shape and with a flip-open cap. It is easier to have Aloe Vera gels in tube form because they are more hygienic. We all know about the aloe vera uses and aloe vera benefits. This aloe vera gel for face has a Dabur Gulabari Rose Water sort of fragrance which I love. The fragrance does not linger on the skin for long. The gel is thick in consistency but spreads very easily onto the skin. I need a very small amount of this for my whole face and neck. I take a very small sized amount of this rose gel and then apply on my face using circular motions this it gets absorbed completely. Then I go on with my makeup application. But this does not moisturize the skin that well. It just soothes the skin and my oily skin does not feel very dry. I think this would be apt of oily skinned beauties during the summer time when we really don't want to use anything on our facial skin. But those with normal or dry skin will need an additional layer of moisture. It has toning properties and I keep it in the fridge all the time and when I use it, the cooling sensation feels heavenly. I use it as an under eye cream at night, although this does not help much with stuff like fine lines and all. It does not help in preventing acne or pimples, at-least for my skin it couldn't and I wasn't even expecting it to do so. It just tones the skin, soothes it and slightly hydrates it too. It did not break me out (pure aloe vera juice kind of gives me more acne). So, I will repurchase this one or maybe their Cucumber gel next time. This tube is very small but the product would last for more than a month if used once daily. Overall, this is worth the price paid and it's a very affordable aloe vera gel available in India. But do not expect pimple control or oil control from this. With soothing properties, this is a winner according to me because I have finally found my oily skin moisturizer! Till I find something better than this, I would stick to it and would recommend you all to give it a try if you want. Prakriti Herbals products are available on FlipKart and on other online shopping websites. Offline availability of this brand is an issue.